Thinking about starting a blog and working from home? I started Bargain Mums as a way to make a few extra dollars as a new Mum, but it quickly turned into a full time business with $4000+ months. If you’re ready to get started, I have a step-by-step tutorial for setting up your domain and hosting here, which makes it super easy to figure out if you’ve never done it before! I also highly recommend and use Siteground for my hosting. 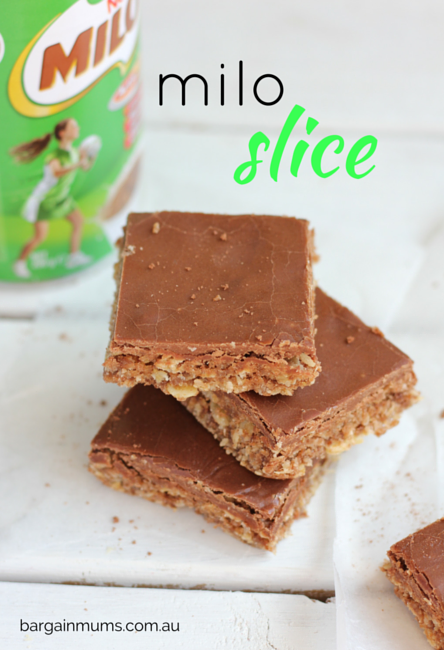 I love slices, they are so easy to make and are perfect for lunch boxes. This Milo slice is slightly chewy, and has a chocolatey taste from the Milo. It’s great on it’s own or decorated with icing. I topped mine with a basic chocolate icing, and drizzled melted white chocolate over the top. Want more? Take a look at our 14 Easy Slice Recipes. Preheat the oven to 180c. Line a slice tin with baking paper. Add all dry ingredients to a large mixing bowl and stir until well combined. Add the egg and butter to the bowl and stir again until well combined. Press the mixture into the slice tin using your fingers or the back of a spoon. Bake for 15 minutes. Allow to cool in tin before removing. Serve as is or decorate with icing. HAVE YOU TRIED OUR MILO SLICE? LET US KNOW YOUR THOUGHTS IN THE COMMENTS BELOW.